Stephen Whalby loves to walk the moor. It is a dark and forbidding place, but it is his. When the body of a young blonde woman is found there, her face horrifically disfigured, the victim of a merciless murderer, his beloved moor is tainted with suspicion and terror. Then a second woman goes missing on the moor and Stephen watches as the search party make their way across the treacherous murder scene. 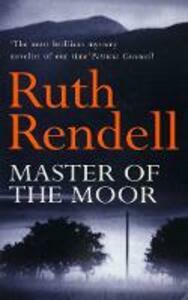 Not to be usurped by a killer or a victim; he, and only he, is the master of the moor.